The kernel used in this release is the latest longterm support kernel, giving a well tested and stable base for the rest of the system. While not critical to the installation process, updated Nvidia drivers have added support for newer Pascal based cards. You can download the installation images either as a torrent, or regularly, both available here. The release notes for Mageia 6 are available here. UPDATE: Don’t worry for classical installer. It’ll return in Mageia 7 release. Stay tuned as our Cauldron is bubbling. The booths were in a different place from previous years, and we had a lot more visitors. We gave out all the flyers we brought by Saturday evening – there was only one left for Sunday – so we gave out Mageia stickers instead. We did not sell any T-shirts, but we sold two USB sticks. Many people asked for general information; I spoke so much that I lost my voice! We had strong interest, coming from people already using a Linux distribution as well as from people wishing to turn to free software. For myself, at a communication level, I am very satisfied by this week end. I must thank the people who were with me: Alex, Kevin and Sayat. They really helped me, because I couldn’t have managed these days alone. The next exhibition will be probably the “Capitol du Libre” in Toulouse (Southern France). If you’re interested in helping me to run the booth, please don’t hesitate to say so. Thank you Dtux, and above all, anyone wanting to join him in November at Toulouse please introduce yourselves, with a comment on this blog, by a message in the MLO French forum, or by posting to the discuss-fr mailing list . Although it looked from the outside as if Mageians were sleeping through August, it wasn’t so! 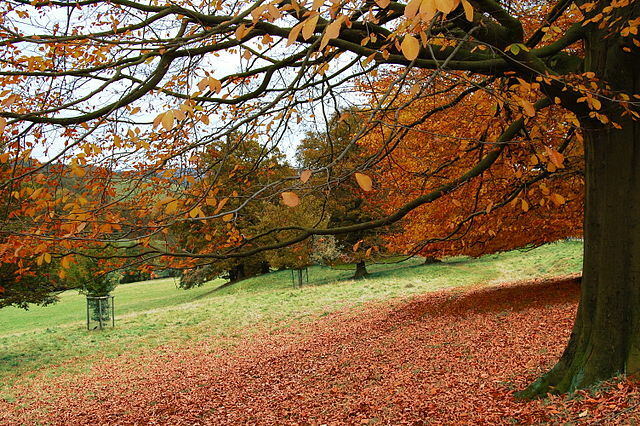 And now that it’s Autumn – fall for you folks in the North Americas – we’ll be more communicative, we promise. Work on the 6.1 Release is ongoing, and we hope to make an announcement really soon; in the meantime, we can let you know that no classical ISOs are planned, simply the LiveCDs and NetInstall. Watch this space! There’s been a lot of updating going on, as the little blue circle with the down arrow, appearing in your system tray regularly, will have told you – and the dev and QA teams have managed to put in a lot of work, for people who were supposed to be on holiday! As always, we encourage our community to join any of the Mageia teams – we welcome you, and we’d really like your help. To make a start, check out the teams at http://www.mageia.org/community/. Support for Mageia 5 is now officially ended! Please upgrade your systems to Mageia 6 as soon as you can, because no more security updates or bug fixes will be coming through. The update is available through the system tray icon, so please make use of it. If you’re upgrading from KDE4 to Plasma, remember: there could be some issues with older video cards. If you’re not sure, make certain before you update that you have another, non-KDE desktop environment installed – Xfce is usually problem-free. Log in to that non-KDE environment before you begin the update. When you’re updating, take the usual precautions, especially since the Grand Plasma Update has happened recently. Make sure you have enough space, and that your internet connection will remain active for the whole process – and if you’re using a laptop, make sure you have your power supply connected. If the process halts before it completes, your system could be unusable. And now for the Roundup! As always, you can check Mageia Advisories, the Mageia AppDB, and PkgSubmit to see the last 48 hours, and Bugzilla to see what’s currently happening. Astonishing numbers of people in the northern hemisphere have been vacationing, harvesting, fighting fires – but there’s still a heap of work happening. Thanks, Mageians! Mageia 6.1 is getting closer all the time, and in the meantime, some of you might have noticed that the Mageia 5->6 update is now available through the systray icon – it’s been enabled once more. To have it work, you need to re-enable “check for new releases” in the Updates Frequency settings in Mageia Control Centre. You’ll also see a different version of the tray icon – instead of the blue circle with the down arrow, you’ll see the orange circle with a round arrow. This is to let you know that Mageia 5 is now officially out of date. Some info from the QA team: if you’re upgrading from KDE4 to Plasma, there could be some issues with older video cards. If you’re not sure, make certain before you update that you have another, non-KDE desktop environment installed – XFce is usually problem-free. Log in to that non-KDE environment before you begin the update. As with all larger updates, if you’re using a laptop, connect to AC power and make sure you have plenty of disk space available and a reliable internet connection. Oh, and did you know? our ancestor Mandrake Linux had its first release on 23 July 1998, 20 years ago! There are even some images around of the old, old logo with (shh!) 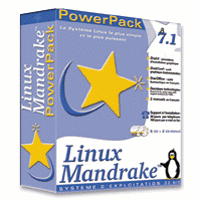 The Hat, which we won’t show you – but here’s one of the Mandrake boxed sets – quite a late one… Lots of us began our journey with some version of Linux Mandrake, and then Mandriva, and now Mageia! RMLL went really well! Our thanks to all those who helped out. 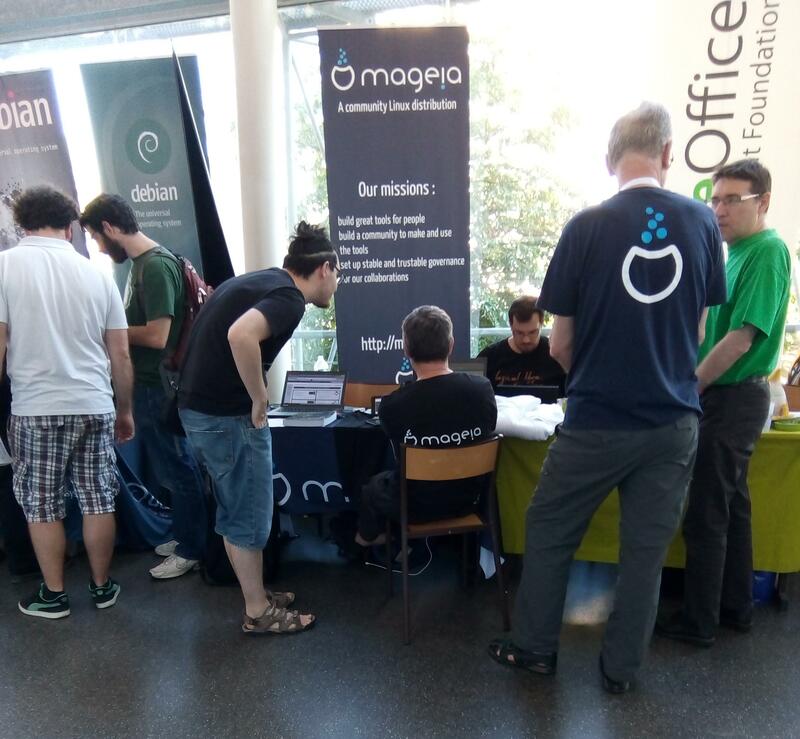 We had enough Mageians to man the stand, and it was great to meet one another, to meet interested users and potential users and to meet contributors from other projects. DTux had brought his well-working RaspberryPi with Mageia 6, and he had also brought an Odroid that runs Mageia – both attracted lots of interest from visitors. Now for the roundup – it’s fairly big, sorry for the delay! And, of course, a whole heap (we didn’t count this time) of updates into Cauldron.